Its 2012 Final Goal Review time. A little late but done. Our big holiday took most of my January but I was determined to do my "ALL year review". I still cant believe January is approaching its end too. 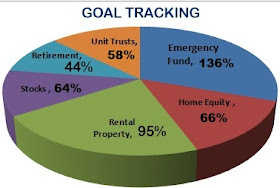 My overall goal was to live on less than 50% of my income and save/ invest the rest. I had all my finance tracking twisted. But I managed to keep the focus whilst tweeking my system. I also made a mistake of keeping part of my income out of the tracking. On average I saved and invested close to 30% of my income. Hubby invested and saved more. Holiday in the Mediteranean Europe outside my home country with hubby. We went with the kids.